Learn how to configure firewall security settings for QuickBooks Desktop. You may encounter errors if your firewall blocks internet access needed for specific QuickBooks programs or files. Updating your firewall to the latest release may resolve the issue. Or you may need to manually configure your firewall software. We show you how. Running the QuickBooks File Doctor automatically opens firewall ports. This tool can be used to configure Windows Firewall. See QuickBooks File Doctor: Fix your company file or network for more information. QuickBooks Desktop 2019 now uses dynamic ports. 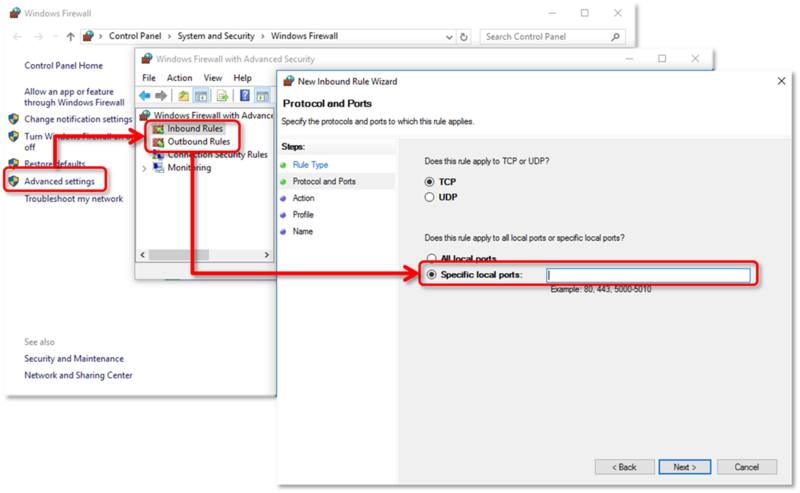 These are specific firewall ports (not a range) assigned during installation to ensure QuickBooks Desktop uses a given port exclusively. The port format for QuickBooks Desktop 2019 is: 8019, XXXXX; where XXXXX is the port number specifically assigned. Open QuickBooks Database Server Manager. On the Port Monitor tab, find QuickBooks Desktop 2019. Take note of the Port Number, which is what you will use for your firewall port exception. Port assignment can be changed by selecting Renew. However you will have to go to the Scan Folders tab. And select Scan Now to re-set the firewall permissions. You can only renew 2019 ports. 2018 and below use static ports defined below. QuickBooks Desktop 2018 and older versions use static ports with given range per year version. It follows the port format: 8019, XXXXX, XXXXX-XXXXX. If you'll be using multiple year versions of QuickBooks Desktop, you need to perform the following for each year version. From Windows search bar open Windows Firewall. Right-click Inbound Rules. Then select New Rule. Select Port. Then select Next. Make sure TCP is selected. Enter the specific ports needed for your QuickBooks year version. Then select Next. Select Allow the Connection, select Next. If prompted, make sure all profiles are marked. Select Next. Give the rule a name, such as QBPorts(year). Select Finish. Repeat the steps above for the Outbound Rules (for step 3, choose Outbound Rules instead of Inbound). Try opening QuickBooks Desktop again in multi-user mode. Or over your network to see if the issue has been resolved. If you’re experiencing errors or problems with connectivity, make exceptions to programs QuickBooks uses in Windows Firewall. QuickBooks uses executable files to perform various functions. See the Configure your anti-virus or firewall programs section for a list of executable files. Then perform the following steps for each file. From Windows search bar, enter then open Windows Firewall. Select Program. Then select Next. Select This Program Path. Select Browse. Navigate the file location. Select Next. Select Allow the Connection. Select Next. Give the rule a name. Select Finish. Repeat the steps above for the Outbound Rules (for step 3, choose Outbound Rules instead of Inbound). Configure your anti-virus or firewall programs. Only perform this if configuring the Windows Firewall doesn't resolve the issue. Due to the vast number of firewall programs available and their ever changing versions, Intuit is unable to provide additional configuration steps. Refer to your software's documentation. Or the software publisher's website for support. Intuit doesn't support or maintain steps on the various internet security programs. In most cases, you should be fine just adding the ports above to the Windows Firewall. If you still encounter errors opening a file over a network or multi-user problems, you may want to try adding the following executable/directories to your 3rd party virus program. Make sure TCP is selected. And enter the ports needed for your QuickBooks year version. See the port number for your QuickBooks version in the Manually configure exceptions and ports section. If you have installed, or will be using multiple year versions of QuickBooks Desktop, you will need to add each year's ports. If you see Program Files (x86), go there as that means you are on a 64-bit Operating system.